Brighouse Town’s pitch has been declared fit ahead of today’s Evo Stik first division north game against Scarborough Athletic (3.0). Paul Quinn’s hosts will be keen for some action after the postponement of Saturday’s game away to Ossett Albion. Town are ninth in the table and their east coast visitors are fifth from bottom. Brighouse, heavily beaten by Witton Albion in their last outing, have signed Ben Atkinson on dual-registration terms from Curzon Ashton. 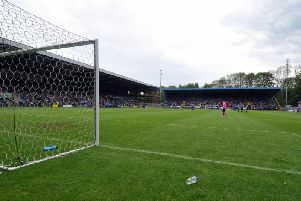 The 20-year-old midfielder joined Curzon in the summer after his release from Huddersfield Town.